If you’ve got Danger Room’s taste in movies, you’ve probably seen both ideas on the big screen. Now Darpa, the Pentagon’s far-out research arm, wants to bring ‘em into the real world. 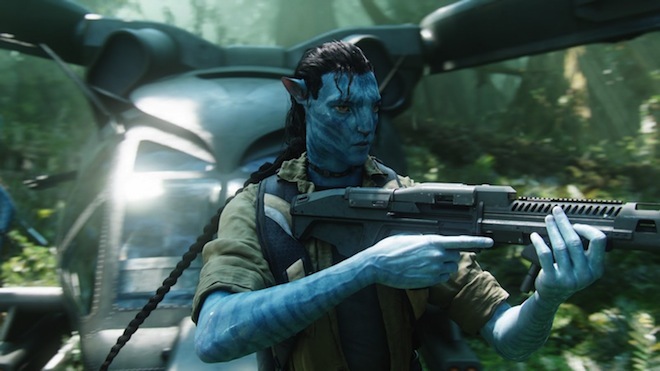 In the agency’s $2.8 billion budget for 2013, unveiled on Monday, they’ve allotted $7 million for a project titled “Avatar.” The project’s ultimate goal, not surprisingly, sounds a lot like the plot of the same-named (but much more expensive) flick. These robots should be smart and agile enough to do the dirty work of war, Darpa notes. That includes the “room clearing, sentry control [and] combat casualty recovery.” And all at the bidding of their human partner. Freaky? Um, yes. But the initiative does strike as the next logical step in Darpa’s robotics research. For one thing, the agency’s already been investigating increasingly autonomous, lifelike robots, including Petman (a headless humanoid), designed to mimic a soldier’s physiology, and AlphaDog (a gigantic, lumbering, four-legged beast), meant to lug gear during combat. And just last week, when Darpa released a new video of AlphaDog cavorting through the forest, the agency noted that they wanted the ‘bot to “interact with [soldiers] in a natural way, similar to the way a trained animal and its handler interact.” AlphaDog is even being designed to follow a human commander using visual sensors, and respond to vocal commands. Based on Darpa’s description of the “Avatar” project, which notes “key advancements in telepresence and remote operation of a ground system,” it sounds like the agency’s after an even more sophisticated robot-soldier synergy. They don’t specify the means, but Darpa’s already funded successful investigations into robots that are controlled with mind power alone. Granted, that research was performed on monkeys. But it does raise the tantalizing prospect that soldiers might one day meld minds with their very own robotic alter egos. And the “Avatar” project isn’t Darpa’s only nod to sci-fi in their new budget plan. The agency’s “Counter Laser Technologies” project, on which they’re spending $4.1 million, seeks to develop “laser countermeasures” that’d protect the military’s weapons from high-energy lasers, and maybe even thwart potential attacks. No, Death Stars are not specifically mentioned. Of course, such super-powerful blasters aren’t yet combat-ready. (Just ask the Army, which has a $38 million laser cannon — without a laser; it’s complicated.) But once they are, the lasers could do some serious damage to existing weapons systems, which is why the Pentagon’s already been after methods that’d safeguard its existing arsenals. In 2008, for example, the Air Force asked scientists to develop laser-proof coatings for weaponry. The Navy in 2009 also launched its own counter-laser initiative, looking for ideas to protect against myriad different blasters, high-energy lasers included. Clearly, a leaner Pentagon budget hasn’t stopped Darpa’s dreamers from watching too much sci-fi. We’re just hoping nobody at the agency’s seen Source Code.